Am 26. April 2011 jährte sich die Katastrophe von Tschernobyl zum 25. Mal. Damals war den Mitarbeitern in einem Kontrollraum des Atomkraftwerks Tschernobyl während eines Sicherheitstests eine Reihe von Fehlern unterlaufen. Um 1:23 Uhr in der Nacht kam es daraufhin zu einer folgenschweren Explosion im Reaktorblock IV. Sie verursachte eine Kernschmelze und löste ein Feuer aus, das zehn Tage lang nicht gelöscht werden konnte. Der radioaktive Niederschlag verseuchte mehr als Hundertausend Quadratkilometer des umliegenden Landes und vertrieb mehr als eine Viertelmillion Menschen für immer aus ihrer Heimat. 25 Jahre später überschattet die Katastrophe von Tschernobyl noch immer das Leben der Menschen und die Umwelt in der ganzen Region. Angesichts der Situation im Kernkraftwerk Fukushima nach dem Erdbeben in Japan 2011 halten uns die Fotos von Gerd Ludwig aus Tschernobyl vor Augen, dass Unfälle in diesem Ausmaß zum Wesen der Kernkraft gehören und sich überall und jederzeit wiederholen können. Gerd Ludwig gilt als einer der führenden Dokumentarfotografen unserer Zeit. Er studierte Fotografie bei Prof. Steinert an der heutigen Folkwang-Hochschule der Künste in Essen. 1973 war er Mitbegründer der Fotografenagentur VISUM und in den folgenden Jahren fotografierte er für Zeitschriften wie Stern, Spiegel, Geo, Time und Life. Der Fokus seiner Arbeit liegt auf ökologischen Themen und den sozio-ökonomischen Veränderungen in den ehemaligen Republiken der Sowjetunion. 1993 fotografierte Gerd Ludwig Tschernobyl im Auftrag von National Geographic Magazine. Im Jahr 2005 kehrt er für mehrere Wochen in die Sperrzone und die vom Niederschlag betroffenen Gebiete in der Ukraine und Weißrussland zurück. Zu dieser Zeit führte das politische Tauwetter in der Ukraine zu mehr Freizügigkeit und man gestattete ihm, tiefer in den verstrahlten Reaktor vorzudringen, als je ein anderer westlicher Fotograf vor ihm. Im Frühjahr 2011 fotografierte Gerd Ludwig erneut im Reaktor und dessen Umgebung. Diese Reise wurde durch eine internationale Spendenaktion finanziert. Der KOMM-Bildungsbereich hat Gerd Ludwig nach Nürnberg eingeladen, um seine Ausstellung, “Der lange Schatten von Tschernobyl”, zum ersten Mal im Süddeutschen Raum zu präsentieren. Mit Gerd Ludwig setzt der KOMM-Bildungsbereich seine Beschäftigung mit gesellschaftlich relevanten Themen fort, die mittels exzellenter Fotografie Inhalt und Form verbinden. 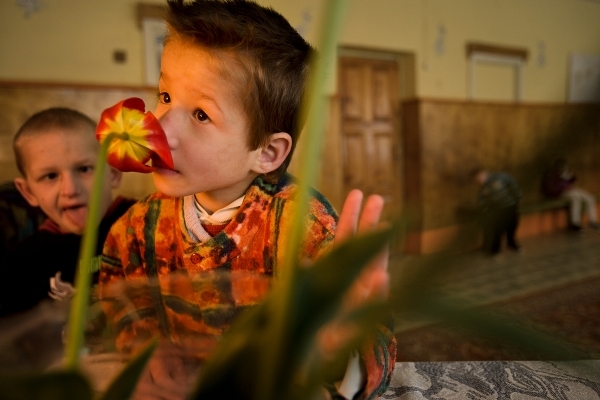 April 26, 2011 marked the 25th anniversary of the Chernobyl accident. At 1:23 am, the Chernobyl Nuclear Power Plant's reactor #4 blew up after operators botched a safety test, triggering an explosion and a fire that burned for 10 days. The radioactive fallout spread over tens of thousands of square kilometers, driving more than a quarter of a million people permanently from their homes. Twenty-five years later, the long shadow of Chernobyl continues to darken lives — socially, environmentally, and physically. From the first day, officials downplayed the damages of the Chernobyl disaster and today, the misinformation continues: A recent United Nations report claims that as the result of the disaster an estimated 6,000 people will eventually succumb to cancer related illnesses. However, reputable environmental organizations state that more than 100,000 people have already died as a result of the accident. 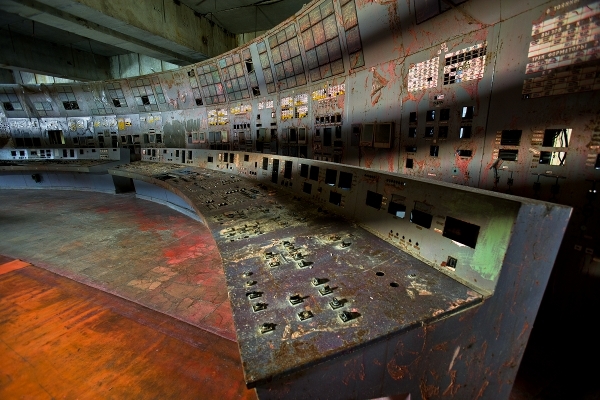 As the world observes the 25th anniversary of the Chernobyl nuclear disaster, and in light of the recent catastrophe at the Fukushima Nuclear Power Plant following the earthquake in Japan, these images remind us that accidents like Chernobyl are a possible outcome of nuclear power — anytime, anywhere. The failed Chernobyl Nuclear Power Plant sits at the core of a restricted area commonly known as the Exclusion Zone. Radioactive remnants continue to smolder inside the so-called sarcophagus, a concrete and steel encasement hastily erected after the accident. Only intended to be temporary, it is leaky and structurally unsound. Scientists agree that it will ultimately give way, shaking loose enough radioactivity to cause a second disaster of even greater magnitude. For years, desperate efforts were underway to shore up the sarcophagus and protect its roof from collapsing. Recently added scaffolding and support beams are holding together the decrepit assembly of the leaning Western Wall. “The thawing of the bureaucratic barriers helped me to venture deeper into the reactor than any western still photographer. 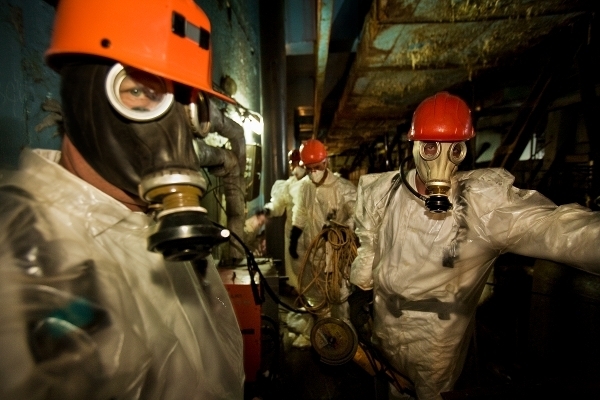 After donning my protective gear, state of the art Geiger counter, dosimeters and an extra layer of 3-4mm thick plastic overalls, I followed a group of six workers into the belly of the beast. The workers, assigned to drill holes in the concrete to stabilize the roof, additionally wore gas masks and oxygen tanks. We had to move fast. The radiation levels in this area are so high that, despite our protective gear, access was limited to a maximum of 15 minutes per day. It was the most challenging photographic situation I've ever encountered. The space was dark, loud, and claustrophobic; we rushed through dimly lit tunnels strewn with wires, pieces of shredded metal and other debris, and I struggled not to trip; while photographing I needed to dodge the spray of sparks from the drillers in highly contaminated concrete dust; and I knew that I had less than 15 minutes to capture impacting images of an environment that few have ever seen, and that I might never access again. The adrenaline surge was extraordinary. After years of negotiations, a French Consortium was commissioned to build a New Safe Confinement, estimated to cost € 1.5 billion. The arch-shaped 29,000 ton metal structure, 105 meters high and spanning 257 meter wide, will eventually slide over the existing edifice to allow deconstruction of the ailing shelter. It will also lock in the approximately 200 tons of melted nuclear fuel rods, keeping the lethal remnants from endangering the globe. The completion date for the confinement has been pushed back repeatedly. Recently, it was announced that the funding shows a gap of € 600 million. Completion is rescheduled for 2015, but officials and engineers on the ground expect it not before 2020 — but say so only off the record. In the 1970s the town of Pripyat less than 3km away from the reactor, was constructed for the plant's personal. Once a beautiful town by Soviet standards, its 50,000 inhabitants were evacuated 36 hours after the accident. Today a chilling ghost town, its buildings bear witness to the hasty departure. Dolls are scattered on the floors of abandoned kindergartens; children's cots are littered with shreds of mattresses and pillows; and in a gymnasium where teens once trained, floors rot and paint peels. Amidst the surrounding decay, 25 years after the catastrophe nature reclaims the town: trees grow through broken windows, and grass pushes up through the cracks of dormant roads that once were glorious promenades — but the town is unfit for human habitation for hundreds of years to come. While television audiences watch the nightly news of the unfolding nuclear tragedy in Japan, others are experiencing the aftermath of nuclear disaster firsthand. They are traveling to Chernobyl — as tourists! 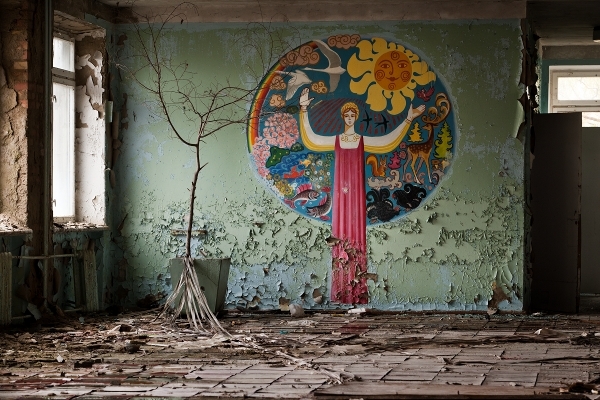 Recently, the Ukrainian government legalized tourism to the Exclusion Zone and hopes for one million visitors in 2012. The first tours are already underway and the most arresting attraction for them is the ghost town of Pripyat, where tourism is leaving its mark: less and less the town bears honest witness to the hasty departure of the former residents. Instead, there are signs of the visitors' need to simplify the message — most noticeably the lonely doll, sometimes neatly arranged next to a gas mask, has become a standard motif. Ignoring radiation levels, several hundred elderly people have returned to their village homes inside the Exclusion Zone, preferring to die on their own contaminated soil instead of a broken heart in anonymous city suburbs. At first Ukrainian officials discouraged them, but soon turned a blind eye and are now even providing them with regular medical check-ups. Finding themselves surrounded by devastation and isolation, many of these returnees have turned to heavy drinking. An estimated 800,000 liquidators participated in containing the reactor, and the gargantuan cleanup efforts following the nuclear catastrophe. Most of them received high doses of radiation resulting in cancers and other exposure-induced diseases, often only showing up decades after the event. 70% of the fallout drifted into southern Belarus, contaminating nearly a quarter of the country. As a direct response to the accident, a children's cancer facility was established in Minsk with aid from Austria. Even though the Belarusian government is downplaying the role of Chernobyl, those scientists and medical personnel able to speak out openly, see a clear connection between the increasing health conditions and the radioactivity released by the disaster. To help the innocent and most needy, international charities fund several institutions for mentally and physically disabled children. Women exposed to the fallout as children, have now reached childbearing age and fear giving birth to unhealthy babies, worrying how radiation may have affected their genes. While several in the scientific community question that birth defects and retardation are directly attributed to the disaster, noted scientist Alexei Okeanov, has described the health effects of the accident as 'a fire that can't be put out in our lifetimes'.